Ziggy may not play guitar, but he certainly has valuable breeding potential. The Przewalski’s colt is growing into a powerful stallion at the Smithsonian Conservation Biology Institute in Virginia. Zygmund, or ‘Ziggy’ as keepers affectionately call him, has been living with his half-sister, Anne, as his companion since August after his mother, Maja, died suddenly of renal failure. Keepers immediately paired him with Anne, who is an experienced mother herself and an easy-going mare. Although Anne is easy-going, she is not shy about signaling to Zygmund when he is playing too rough or irritating her. He displays various behaviors that are normal for a young colt of any horse species or breed. He will sometimes mock-charge and approach back-end-first to test Anne’s reaction — and even the keepers’ reactions. Ziggy is now mixing with the wider herd. He has gained about 100 pounds since the summer and has been eating solids, including hay, grass and apple fiber biscuits for the past three months, but he still has a lot of growing to do. Full-grown male Przewalski’s horses can weigh up to 800 pounds and can stand up to five feet tall at the shoulder. Zygmund’s size is not the only thing that is changing. As the days are growing shorter and colder, his longer winter coat is coming in. Przewalski’s horses are well adapted for the cold and can withstand extreme temperatures. In Mongolia, where they live in the wild, the temperature can dip as low as 50 degrees Fahrenheit below zero. At the institute, it is not uncommon for the Przewalski’s horses to choose to spend time outside in belly-deep snow during the winter. They also have heated barns where they can spend time. Anne and Zygmund had been living next to the female herd of Przewalski’s horses for the past few months, but on November 21, Zygmund was introduced to the full herd for the first time. He is big enough and strong enough to hold his own in the herd now. 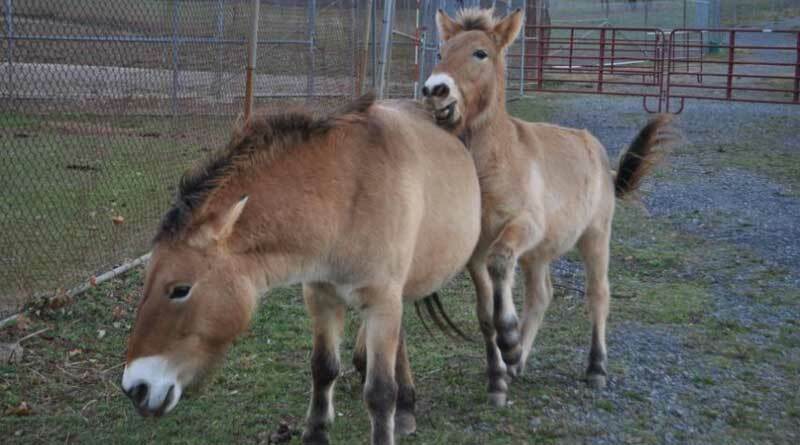 Przewalski’s horses live in harems that are hierarchical, so it is normal for them to sometimes push or kick each other. The introduction was smooth and uneventful, with the mares not interested in any of Zygmund’s shenanigans. Now that he can interact with other females, he will also learn some manners from them in addition to Anne. He and Anne will still be separated from the herd at night to make sure he gets his full feed ration, but during the day they will join the rest of the mares out on pasture. The Przewalski’s horse is the last wild horse in the world. It has never been domesticated and every Przewalski’s horse alive today is descended from a population of 14 founding individuals. The species went extinct in the wild in 1969, but thanks to reintroduction efforts a population of about 500 horses now live in Mongolia, China and Kazakhstan. Smithsonian scientists use GPS collars to track and map the movements of reintroduced horses in China, and are working with colleagues at The Wilds in Ohio to develop new solar-powered tracking devices that can be braided into horses’ tails. These new devices could allow scientists to collect more data on horses in the wild. In Virginia, the Smithsonian’s animal programs team and scientists breed the species based on recommendations from the Przewalski’s horse Species Survival Plan. The plan makes breeding recommendations to preserve as much genetic diversity in the population in human care as possible. The scientists are also developing assisted-reproduction techniques for the species, which will also help boost genetic diversity.